Lloyd Carr was a quiet man. He ran, by all accounts, the cleanest, most by-the-books program in the entire nation for basically his entire tenure at Michigan. He recruited good players and good people. There were occasional busts and misses--players that got caught up in the wrong crowd--but for the most part, Carr should be commended for how he avoided negative publicity by being such an upstanding coach. Ryan Mallett was the heir to the Chad Henne throne. Incumbent backup Jason Forcier (whose younger brother Tate is the current Wolverines signal caller) was clearly a third option once Mallett showed up on campus--the cause of the elder Forcier's untimely transfer a year before Rich Rodriguez rolled into town with a system perfectly suited for Jason. So when rumors started to fly about Mallett's attitude problems and discontent, people started to turn against the soon-to-be-crowned golden boy. And when the most damning story of all hit the rumor mill (that Carr called Mallett into his office and literally threw transfer papers at him), the writing was on the wall and Mallett was a goner, even before the spread offense came to Michigan. 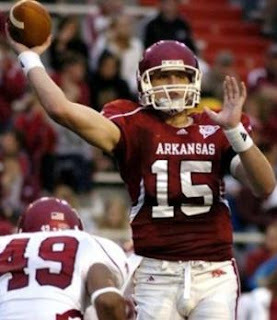 It is for these reasons, as a Michigan alum, that I rather detest Ryan Mallett. However--and I cringed to type this--he is as advertised. A 6'6" mancannon that hurls the ball with uncompromising accuracy and velocity, he's now three years into his college career and, now that he's given the opportunity to start, proving that he was worthy of his recruiting rankings. It is for these reasons, and my distrust of Alabama's ranking, that I think Arkansas will walk into Bryant-Denny Stadium and come away victorious. Some of this may have to do with strength of schedule. Also, and more importantly, Alabama was able to beat up on some mid-majors (two, Arkansas has only played one), while Arkansas had a bye week and allowed 52 points in their 41-52 loss against Georgia, during what proved to be a complete shootout. Alabama allowed 24 points (and only scored 34) against Virginia Tech in the season opener. Va. Tech is 44th is scoring offense and 45th in scoring defense. 34 points for Alabama against Arkansas isn't going to get it done this week. So what it really boils down to, in my opinion, is this: Can the Alabama defense contain Ryan Mallett who has proven to be an exceptionally accurate passer? Can Alabama keep up with the scoring frenzy that Arkansas is almost sure to unleash? A lot of the pressure of this game falls on Alabama because of their position high in the Top 25 and Arkansas in the midst of rebuilding (although it appears they're nearly done). I expect this one to be close but for Arkansas to eventually run away with it because of their ability to constantly put up points. Nice Chirs, very nice. I often wonder what goes on in your head, and here it is. Marky V would be proud. Not at all. Just wait until you see what I unleash.